When it comes to drag racing, being the fastest and the quickest is such a pleasure. Today we are presenting you the fastest import E.Kanoo’s racing Supra. 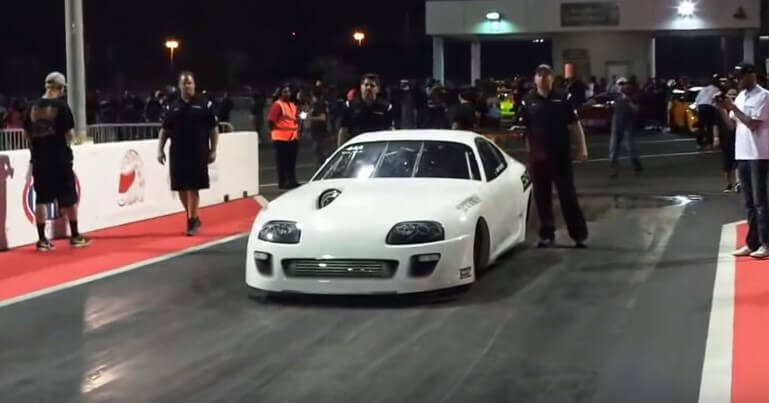 The 10.5 Outlaw Supra has made its owner proud by being able to rip off a 6.15-second pass while topping 240 mph in the short distance of 1.3 feet. Congrats to the new record holders! This Supra was built by Titan Motorsports and owned by E. Kanoo. In this epic moment, Garry White was behind the wheel of the 2JZ powered Toyota that has more than 2400 HP. Being the best in any category feels good! In the video below, you will hear and see something astonishing: white beast becoming one of the best. So turn up the volume and get ready for some good action. Check it out! The World’s First 3D Printed High Performance Car – The Blade! Scooter Racing Turns Into A Boxing Fight – Let The Best Man Win!! Jeremy Clarkson’s P45, the smallest car in the world!